Running an online support desk is something many companies will want to do. It allows customers to easily communicate via a website, suggesting new features, reporting bugs, or otherwise asking for support. 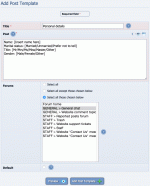 Composr can be used as an effective support desk tool. The support ticket system is designed specifically for the handling of support issues. It is a relatively simple system, that is tied into the discussion forums for actual storage and moderation of support tickets (each ticket is stored as a forum topic). Admin Zone > Setup > Support tickets. You can delete a support ticket type from the bottom of its edit form. Support tickets are created simply by visiting the support ticket page, clicking to add a ticket, and filling in the appropriate details. Upon completion of this, an e-mail is sent to the staff, and the staff can then respond to the ticket as appropriate. The support ticket system supports attachments, but only in Conversr . Guests may create support tickets, but they need to leave their e-mail address (there is a field for this) if they want a reply. 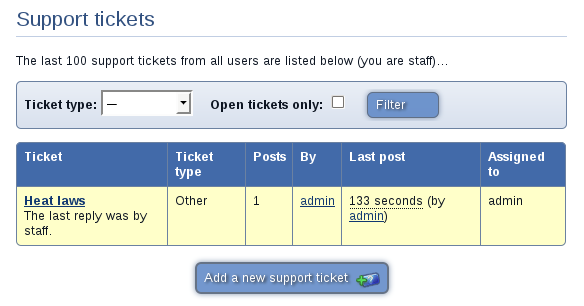 Staff will see all open support tickets when they visit the support ticket page, but users may only seen their own. If the support ticket list is left open then it will automatically make your computer beep if a new ticket is made, and refresh to show that new ticket. Likewise, if a support ticket is left open, your computer will beep and the ticket will refresh, if a new post is made in the ticket. As described earlier, the forum is used to store the tickets. 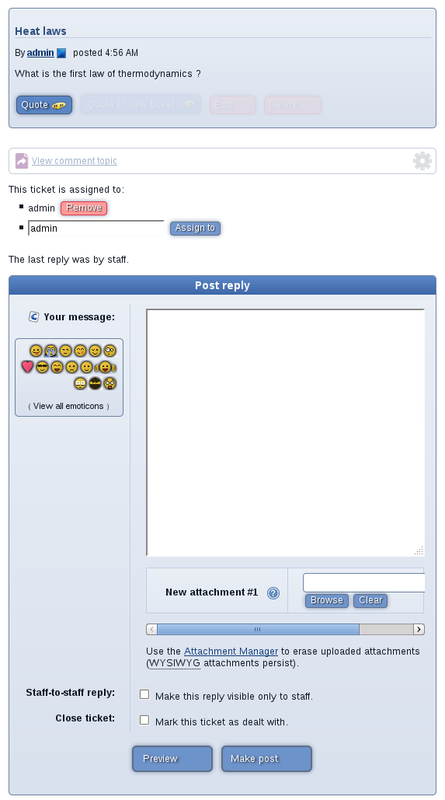 The ticket forum should not generally be used for making or managing support tickets. It is also generally configured as closed to regular users (i.e. staff-only). 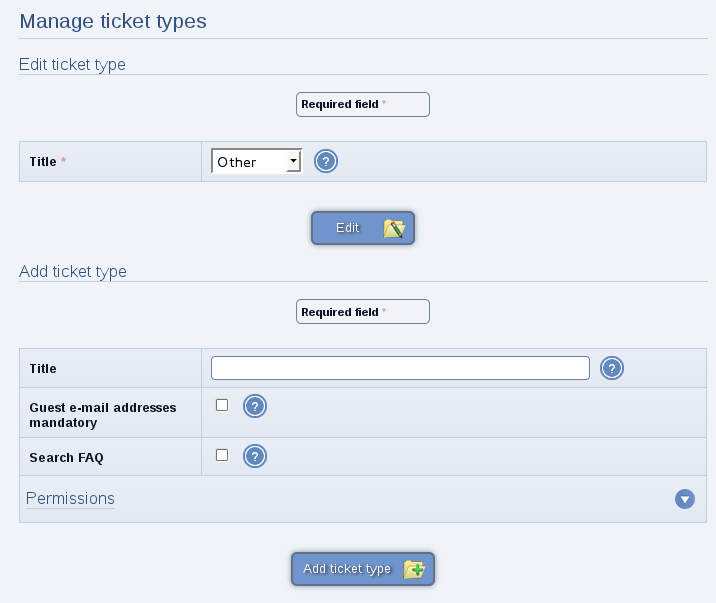 The primary interface for making or managing tickets is the tickets module (site:tickets page-link, About > Support tickets on the default menus). The tickets are stored on the forum as they are built on top of our feedback subsystem, which is designed to integrate well with forums (so you can find new posts there etc). This includes all forums Composr supports, not just Conversr . The feedback system is also what powers comments (e.g. comments on news). 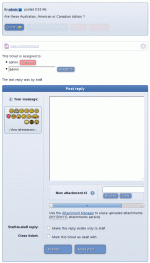 The main interface is not built on forums as we cannot extend the features of what is a potentially third-party forum. Each individual topic viewed from the forum will give you a link taking you back to view that topic as a ticket, to help you get over to there if you're coming from the forum. It is usual to use page access permissions to restrict access to the support ticket page, so that only those that may request support may access the system. There is an option to allow people to e-mail in to the support ticket system. This requires the PHP IMAP extension to be installed. E-mails are matched up via the ticket ID in the subject line. If there is no ticket ID, a new ticket is made. Composr makes some attempt to clean up the e-mail text, so that the tickets are not too much of a mess. E-mails can be forwarded to the integrated address. This is very useful when customers e-mail staff directly to try and subvert the support system: it prevents you having to lecture the customer on support processes, or break process to reply to them directly. This is useful if Composr cannot match the originating e-mail address automatically. Often people have multiple e-mail addresses. Composr will learn, so you only need to do it once per person. If Composr can't find a match it will e-mail you back saying so, rather than logging the ticket against a Guest. You can override this behaviour via tagging against [Guest]. You can also use square brackets to specify the ticket type to log as. Composr "intelligently" matches things in square brackets against whatever it can. 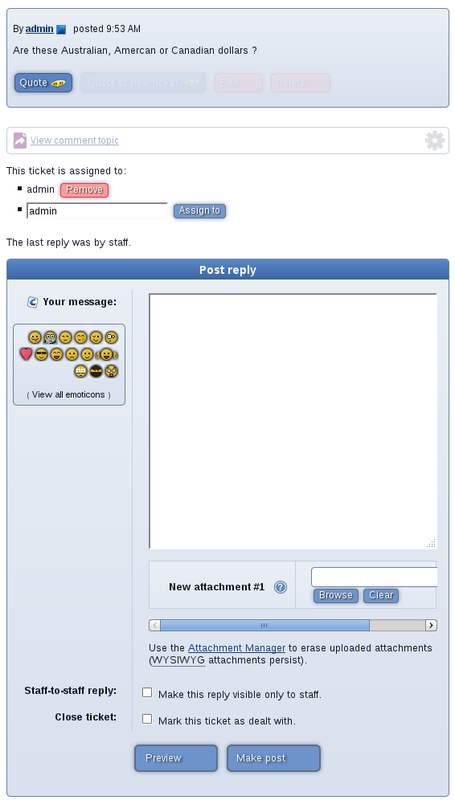 The Messaging system is designed to allow staff to easily receive messages and organise themselves with respect to those messages. It is different from the Support Ticket system because the Messaging system is designed around staff planning, and unlike support tickets there is no inbuilt reply mechanism to reply to messages received (although people may leave their contact details). It is optimised for managing feedback instead of maintaining customer relationships. The Messaging system hooks up to the main_contact_us block. For more information on this, see the Feedback and user interaction tutorial. You can place multiple contact-us blocks, each identified with different IDs. Staff members may set notifications for them individually. The Discussion Forum (our own Conversr, at least) is designed to be an extremely efficient multi-purpose working environment: forums are at their heart an interactive communication medium. There are also a number of special features, such as post templates, and multi moderations, that make the forums particularly appropriate for use to provide support. Post Templates allow you to help members standardise the formatting of their posts. This can be especially useful in situations such as where you have a support forum, and with every bug report you require people to give you certain information. Simply creating a post template containing prompts for that information can ease the strain of support considerably. To add a post template, just open up the 'Add post template' screen in the Admin Zone (Go to Admin Zone > Structure > Forums > Post Templates), and fill in the forms. You can delete a post template from the bottom of its edit form. Composr provides useful features such as limiting the use of a post template to certain forums, making the post template the default post in the specified forums, and limiting use of the template to members of a certain minimum status. To use a post template, simply submit a new topic or post using the verbose posting form (i.e. not the quick-reply box). 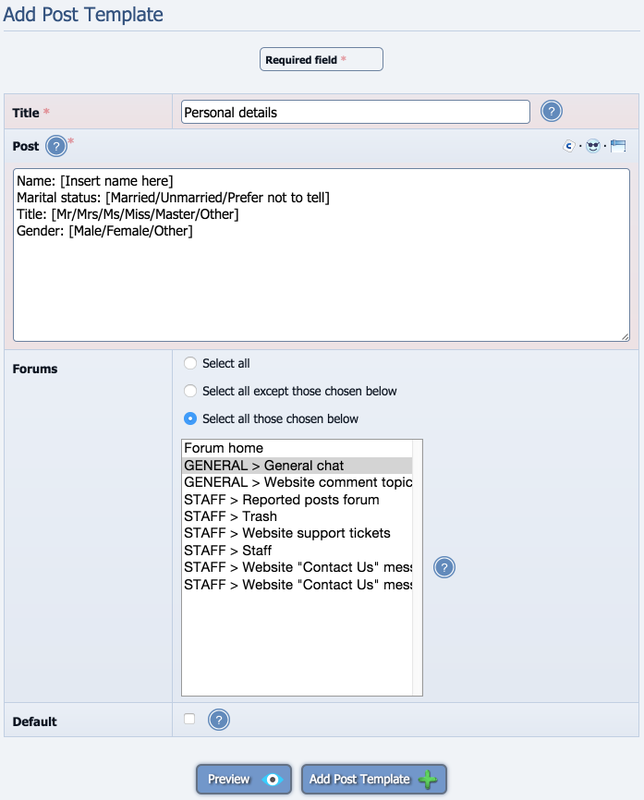 On this form, if any post templates are defined for the current forum, a post template drop-down list will appear. Using this list, you can select a post template to use. If a post template has been marked as the default post for the current forum, the post field will already contain that post template. 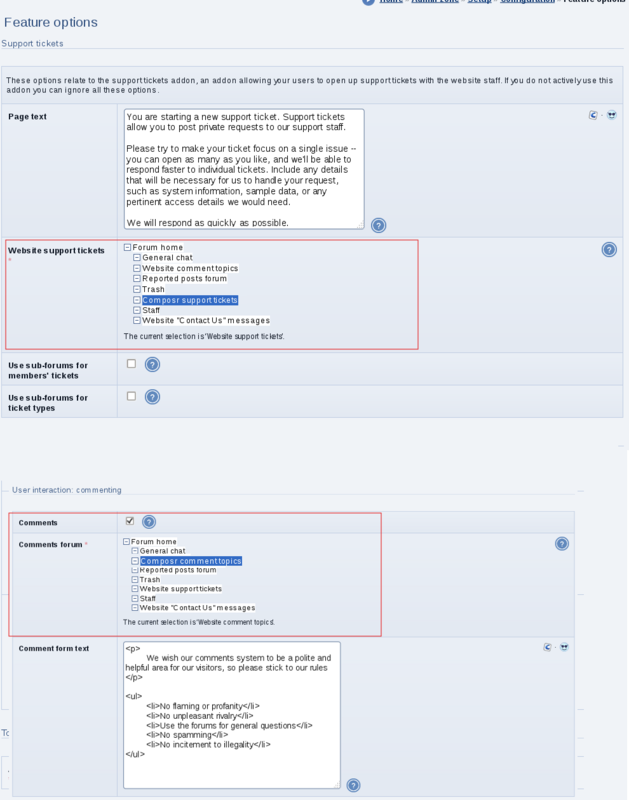 Most forms of Composr content support commenting, via the feedback system. For example, if enabled for a download, and in Composr, the download may have an attached discussion. This discussion is actually stored on the forum in a comment topic. The advantage of the feedback system over the Discussion Forums is simply that the discussion is attached directly to actual content. For example, comments posted on a download may contain questions and answers relating to the download itself – very simple and convenient for users. 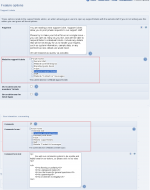 To use the feedback commenting system, you must not be using the none forum driver, and you must have created the comment topic forum that is referenced in the Composr configuration (for Conversr it's auto-created). Composr does not come with its own issue management database, but we have a non-bundled addon that includes an integrated modified version of Mantis. A virtual support desk is the virtual equivalent to a companies real-world help-desk/support-department/reception/call centre.